The average life span of an aircraft in US military service is about 25-30 years; sometimes more if the airframe is extensively overhauled. Most modern tactical aircraft (and we are talking fast jets) have an airframe life of around 5,000 hours. Patrol and cargo aircraft are much, much more, but they don't have to deal with the sort of stresses that are routinely a part of the flight envelope of a fast jet. The F-18A-D Hornet was already in service and doing a fairly good job of things, despite being unable to meet the original goals of the design in terms of load carrying and range. It was postulated that a modified Hornet would be able to meet the needs of the Navy as a Tomcat replacement and have commonality with the earlier versions of the F-18. Sounded great to the Navy planners and so they OK'd the design. 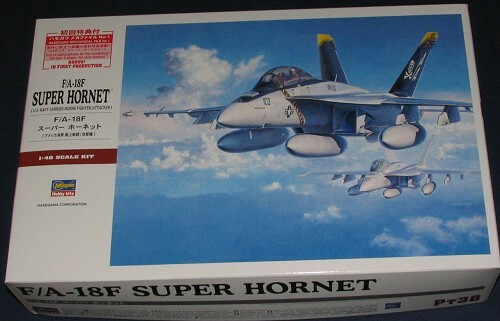 Well, as things turned out, many modifications had to be made to what was now referred to as the Super Hornet. The end result was a larger aircraft that has almost no commonality with the earlier version other than the designation. It also suffered from an inability to meet all its design goals, but as it was an improvement over the existing F-18 (though not as good an airframe as the F-14), and with nothing else on the horizon, the decision was made to go with it . The resulting aircraft, which first flew in 1995, is now becoming fully integrated into the fleet. At first, a couple of attack and old Tomcat units transitioned to the single seat F-18E. Now, with the retirement of the F-14, some of the remaining squadrons either have transitioned or are in the process of doing so into the F-18F. The F is a twin-seat version of the F-18E and will be used as a fleet defense interceptor, much like the F-14, but without its long range Phoenix missile. The F-18F is able to carry the latest generation of AIM-120 and Sidewinder missiles. It also incorporates as much 'stealthiness' as it can with the gear doors having serrated edges and other parts of the airframe (such as the intakes) designed to be less visible to radar. Those few that have been used in combat (albeit against light defenses) have proven to work as advertised and more are due to be built until it, too will succumb to old age and be replaced by something else on down the line. 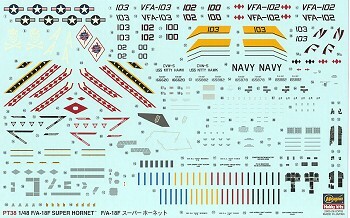 To many of us, it was only a matter of time before Hasegawa would come out with a Super Hornet kit. We also knew that Revell-Monogram was going to produce one and we were left to wonder who would come out with theirs first. In today's market, the cost of producing a kit like this is high and for two major players to be releasing the same kit at about the same time seemed like poor planning. Much to our delight, each company came out with a different version of the aircraft and within a week or so of each other. Hasegawa chose the twin seat version and a real beauty it is. While the sprues don't bulge in the box, there is everything in there that we want. There are three bags of sprues. One with the clear bits, and the other two with the rest of the sprues. One sprue with the fuel tanks is duplicated and contains other bits like bang seats, pylons and the like. The fuselage is split horizontally with many of the seams fitting on the underside of the leading edge extensions. All of the flight surfaces have separate control surfaces, which is great as the Hornet normally has the flaps bled down after sitting for a while. Separate flap actuators are provided for this feature as the flight controls are designed to be in the neutral position. One would expect a well appointed cockpit in a Hasegawa 1/48 kit and one gets it. Two nice seats (no belts), and various control sticks fit into the tub. Consoles and instrument panels have raised detail, though decals are also provided for those who like to use them. Nicely detailed wheel wells and complex looking landing gear are part of the mix. Intake trunking is given, though taking care of the seam will require a bit of a challenge to fix. The wing tips can be removed and put into the folded position if one wishes to do so. For things under wings, you have four fuel tanks, a pair of AMRAAM missiles (with separate flight surfaces) and on the wing tips, a pair of AIM-9X Sidewinders. An ASQ-228 FLIR pod is also provided for one of the engine side mounts. Finally, the canopy can be displayed open and a boarding ladder is included as well. 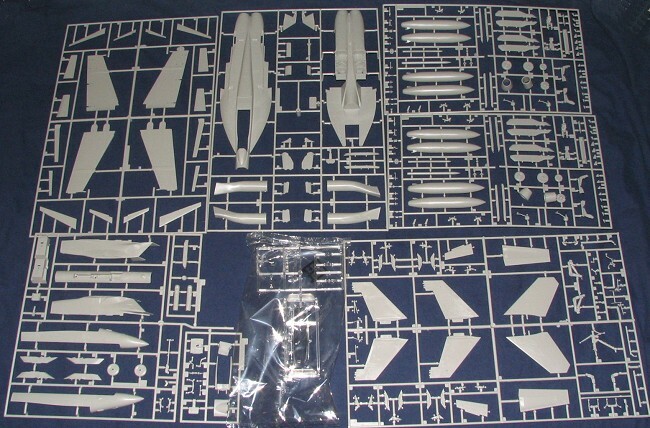 Instructions are all one would expect from the world's premier airplane kit maker and have the usual Gunze paint references. Markings are given for two aircraft. 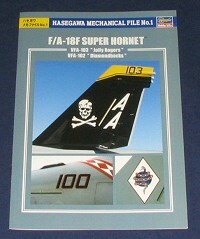 One is the box art airplane from VFA-103 'Jolly Rogers'. The black markings will have to be painted , but all the rest of th e stuff is provided on the sheet. The other is from VFA-102 'Diamondbacks' that is part of CAG-5 aboard the USS Kittyhawk in Japan. The decal sheet is superbly printed and should work very well. The white parts do appear to be a tad transparent as the blue backing of the sheet seems to bleed through a bit. However, this shouldn't be a problem as there are no strong differences between the background colors. It will be interesting to see how well these work and I'm sure that there will be a plethora of aftermarket sheets available soon for those who want something a tad different. Included in this initial release is a nice 8 page color booklet that has photos of real F-18Fs. Should be a real help for that extra bit of detail and is a nice addition. I'm sure the fast jet crowd already has their kits in hand or on order. It is a bit pricey as models go, but then, when compared to the rest of the market, it is in line. One thing for sure, it is an outstanding kit and is sure to look just superb when it is finished. If you would like your product reviewed fairly and fairly quickly by a site that has nearly 300,000 visitors a month, please contact me or see other details in the Note to Contributors.